Finding the ideal club could be the key to mastering the putting green. Every golfer knows how it feels to fall out of love with his or her putter. First, there’s the sinking feeling of betrayal when the ubiquitous 3-foot putt scoots past the hole. Confidence soon gives way to doubt, and anxiety heightens every time you lean over your ball for that final stroke—the one that can cancel out your spectacular drive and approach shots. If this sounds familiar, you’re in good company. In June at the Travelers Championship, Rory McIlroy changed putters three times in three days and was seen trying five putters on the practice green before one round. This is not a new issue for the professional golfer, who is stellar from tee to green, but ranks well below average for his putting on the PGA TOUR. He’s looking for the perfect match, just like every other player. Every club has changed drastically over the years. Thanks to technological advances in woods and irons, golfers hit the ball farther and with more control than ever before. The results of this evolution are demonstrated on the green, where a short putt counts the same as a 300-yard drive, and having the right putter is critical. Simple blade putters have been around since the early 1900s and were especially popular in the 1940s, when the bull’s-eye putter made its debut. In the mid-1960s, peripheral weighted putters (weight in the heel and toe for consistency and forgiveness) putters like the Ping Anser came into vogue. Later on, the modern era ushered in mallet-style putters with a lower center of gravity and an increased moment of inertia (MOI) to reduce spin. The larger surface allowed manufacturers to decorate them with lines, balls and other graphics and shapes to help golfers line up their putts. Additional refinements to the three basic shapes came next. Soft inserts in the putter face were made for players who used hard balls but wanted a soft ball feel, while grooves in metal faces were developed to reduce skidding, backspinning and hopping on impact. The SAM PuttLab shows instructors a variety of statistics on every swing. 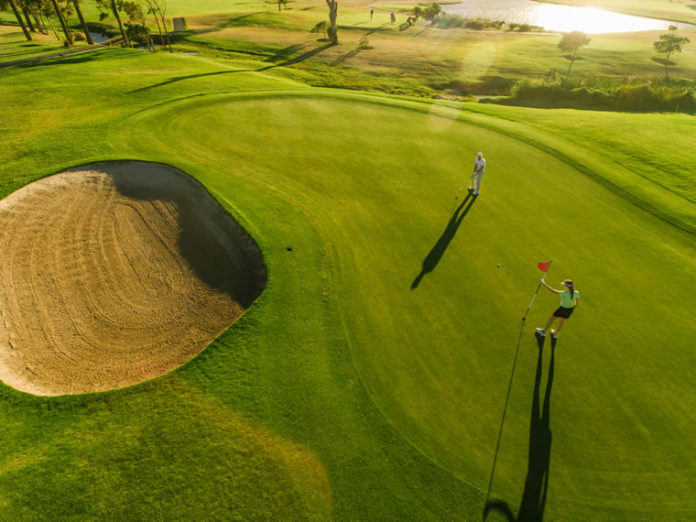 “Once you come to the realization that putting is the most important part of the game, that’s when you become a real golfer,” says instructor Mike Shannon. He has specialized in putting for more than 20 years and he is the inventor of the Laser Optics Putting Improvement System. If a bent putter is not the issue, then the evaluation process continues. Shannon takes a look at the lie, loft length and weight. Each player makes five putts on a putting analysis computer—the Golf Performance Center uses both The Optimal Motion Instructor, as well as SAM PuttLab. The computer shows Shannon more than 20 statistics, including where the golfer aims, which will determine the best hosel (where the shaft affixes to the putter head) position for him or her. The second measurement the instructor gets from the computer is the degree of face rotation. “The putter shaft is inclined, not vertical, so the perfect stroke is a slight arc with the face opening four degrees during a 6-inch backswing and closing 4 degrees 6 inches after impact—a total of 8 degrees of rotation,” Shannon says. “On the PGA TOUR, every player has a rotation between 6 and 12 degrees. Next, Shannon checks the putter length. According to the instructor, most players’ putters aren’t long enough, causing their arms to be too straight while they play. This causes problems such as loops and figure eights in the backswing due to too much arm and hand movement. Lie, the amount of incline in the shaft of the putter, is the next measurement. Shannon’s goal is to hit the ball in the center of the putter face—which, if the lie is correct, should be easy. However, if the toe or heel is off the ground, the point of impact drops and the player can easily lose control of speed and distance. According to Shannon, the most misunderstood part of putter fitting is weight. “The putting stroke has no force,” he says, and goes on to explain. “The normal clubhead speed of a driver is 70 to 100 miles per hour. On a typical 30-foot putt, the putter is traveling at 7 miles per hour. So, comparatively speaking, the putter stroke has no force.” Without force, Shannon says, mass becomes the overriding factor, slowing down your stroke and shortening your distance. For those playing on fast greens, moving to heavier putters will give them more control over the ball. Shannon’s putter fittings are also fine-tuned to where the golfer plays most of the time. For those playing in the Midwest and Northeast, Shannon advises a heavier putter thanks to greens that feature good bentgrass, which allow for firmer and faster play. Meanwhile, in Florida, South Carolina, North Carolina, Georgia and Texas, Shannon says players should go a bit lighter. However, for competitions, it’s all about a heavy putter. “If I’m working with a competitor, I’m going to go heavier … because tournament sites speed up their greens,” Shannon explains. The instructor is also seeing smaller-headed mallets gain popularity thanks to their compact size and playability. However, no matter what the TOUR pros are using, one thing is sure—finding your perfect putter match is an individual journey that pays off in the long run. Instructor Lindy LaBauve provides her best tips for getting the most out of your Sea Island club-fitting experience. 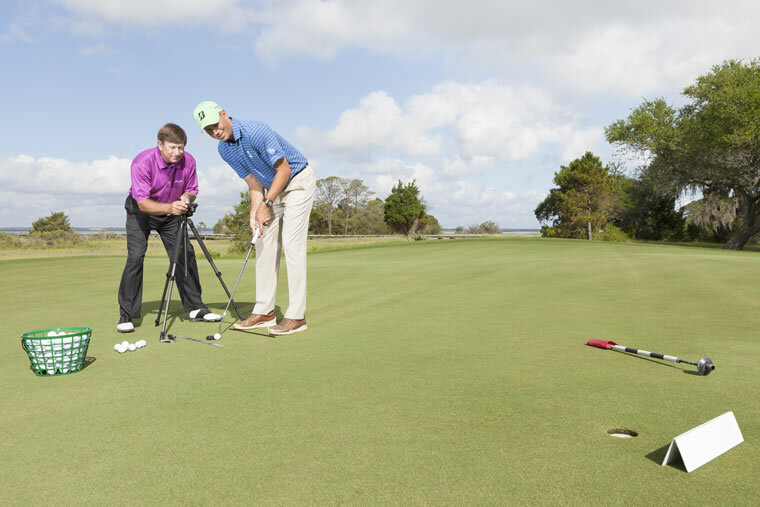 “Putters have changed because greens have changed,” says instructor Lindy LaBauve, who has studied extensively with putting expert Mike Shannon and does many of the putter fittings at the Sea Island Golf Performance Center. “Today’s putting surfaces are cut 50 percent lower than they were 15 to 20 years ago,” she explains. “Old putters were designed with enough loft to get the ball on top of the grass and rolling forward. Now that’s unnecessary, so manufacturers have reduced loft from 6 degrees to 3 or 3.5 degrees. As greens have become faster, putters have become heavier to increase consistency and speed control. You get it started and it swings on its own. You let the putter do the work and the stroke smooths out. LaBauve says that players should focus on perfecting the three elements of putting: solid contact, speed control and aim/read. The first means knowing you’ll be able to make solid contact every time, the second should be as predictable as you can control for, while the last depends on contact and speed.